With wide spread proliferation of low cost wireless technologies such as WiFi, BLE etc and smart phones, there is a need to provide such connectivity to systems across application domains. For example, nowadays wellness industry expects the products such as thread mills to communicate with user phones and provide details of the calories spent so far along with the running pattern. While it might be possible to incorporate the wireless features in newer designs, there are many cases in which the existing systems need to provide these new features with minimal design changes due to reasons such as re-engineering complexity, costs etc. This calls for Bluetooth to Serial Adapter that can be interfaced to existing systems over UART and enabling wireless connectivity easily with minimal changes. 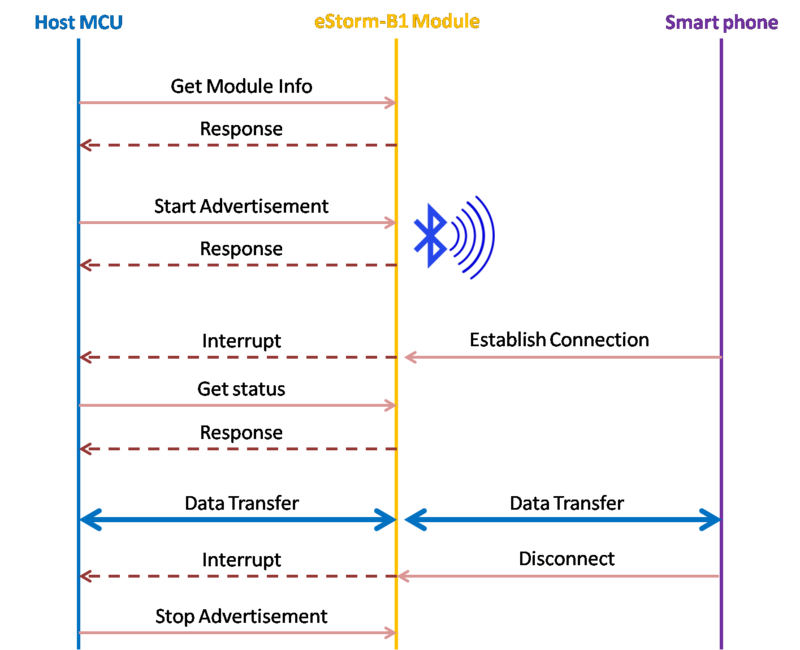 In this blog, we will discuss in detail about such an application where by Embien’s eStorm-B1 platform is used as a Bluetooth UART module and performing BLE communication to an Android mobile app. Embien recently launched “eStorm-B1”, an automotive ready BLE module as a part of its eStorm offerings. The module supports many peripherals and interfaces such that it can be used as a standalone system or can embed in an existing system to enable BLE communication. Of the available interfaces such as CAN, SPI, I2C etc, this particular demo uses UART as the choice of communication. For such application, eStorm-B1 will act as a slave module which can receive commands from the host processor via UART and do actions accordingly. The host processor and the module are connected via TTL UART interface. Interrupt signal from eStorm-B1 can be routed to a digital input of the host processor with interrupt detect functionality such that the host processor is made aware of the connection event occurred between the devices. 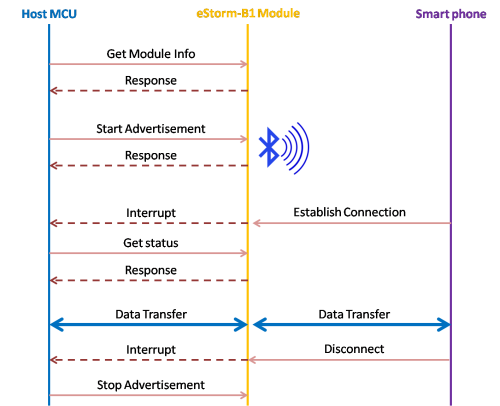 eStorm-B1 can operate in sleep mode where it consumes ultra low power and the module can be switched between active and sleep mode suitably when data transfer is required. Based on a simple command set, the host processor can speak to the eStorm-B1 module and in turn communicate with another BLE device such as a smart phone, tablet or an IoT gateway. The following video shows the real time demo of eStorm-B1 UART to BLE bridge application typically applicable in many IoT device developments for enabling BLE communication on existing system. To show case the same, instead of a host MCU, a PC is used and connected to the eStorm-B1 over an USB to UART bridge. PC is connected to eStorm-B1 module via UART interface using an external commercially available UART to USB converter. Tera term, a terminal emulator is used to transfer the data’s from Laptop to eStorm-B1 module via UART. On the other end, a custom Android application installed in Smartphone is used to receive and transmit the data via BLE. UART to BLE Bridge is suitable for various device designs such as wearable device in healthcare, key finder, tire pressure monitoring system in automotives, asset tracking in industries, etc. Apart from the above mentioned features, the eStorm-B1 also supports rich peripheral options such as timers/PWM, ADCs, GPIO’s which adds more advantage for standalone system developments in various domain applications such as automotive, industrial, healthcare etc. About Embien: Embien Technologies is a leading provider of embedded design services for the Semi-conductor, Industrial, Consumer and Health Care segments. Embien has successfully executed many projects for IoT product developments such as healthcare/wellness wearable’s, data acquisitions systems, Gateways, and Data Analytics platforms etc. Embien also offers a set of wearable design collections complete with electronics, firmware and Cloud that can be used to shorten product development costs and time significantly.